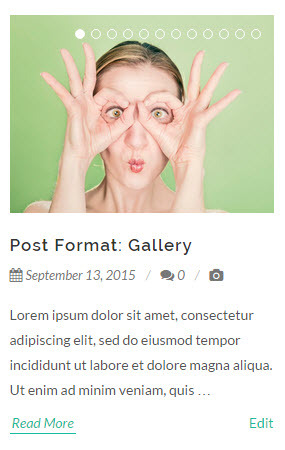 When you write a blog post, you will notice a box to the right of your text editor called Format. Within this box are the 4 format options: Image, Gallery, Video and Audio. 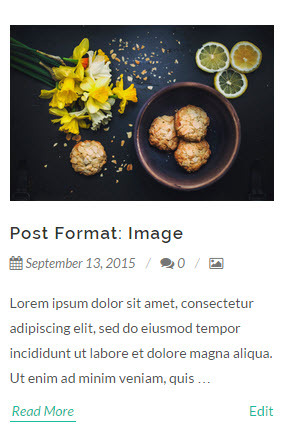 Choosing Standard will result in a normally-formatted blog post, while each other options has a unique design associated with the format type. Using the Image Post Format. If you've set the Feature Image for the post, the post format will be set as Image automatically. A thumbnail image will be placed at the top of your post. Using the Gallery Post Format. If you upload more than one image to your post, the post format will be set as Gallery automatically. It will place a gallery at the top of your post instead of the standard thumbnail image. Using the Video Post Format. If you select Video within the Post Metabox, the post format will be set as Video automatically. It will place a video at the top of your post. Using the Audio Post Format. 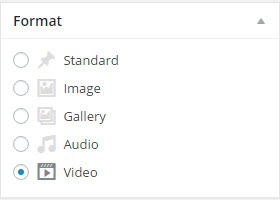 If you select Audio within the Post Metabox, the post format will be set as an Audio automatically. It will place a video at the top of your post.